Today, Lilly Elizabeth Hawn earned the angel’s wings we always knew she had. She was my Heart Dog – my canine soul mate. Gone from this life, she lives forever in my heart. Goodbye, beautiful girl. Thank you for everything. I am so sorry. I know how hard it is to say goodbye. Thinking about you and sending lots of hugs your way. May Lilly run fast and forever free. RIP LIlly. Hugs and kisses to Ginko who must feel the loss and his special place in your smaller family. Words, there just aren’t enough in the world to express my sympathy.. you are in my prayers. May all of your memories give you some sort of peace and happiness. Goodbye sweet Lilly, may you now run and jump for joy. I am so, so sorry for your loss. You both fought hard. Now rest, and remember the love. It has been both inspiring and heartbreaking following your journey with Lilly. I am shedding tears as if I personally knew you both. Your writing has allowed us all to get a glimpse of the good, the not so good, and the love through it all. I am so sorry that your little girl has passed. It has not been an easy go for you lately, and I am grateful for all you wrote. I will remember Lilly in my prayers and know that loved ones may pass, but we will see them all again. Until then . . .
Yours and Lilly’s blog remains one of my favorite for its reflection of pure love and the bonds between dog and person. I’m so sorry to hear of Lilly’s passing, but she is forever close. This is the day we all dread. I’m so, so sorry for your loss. But, as so many people have said, Lily has touched a lot of lives through your blog. She will live on. You said it simply and beautifully. I feel the exactly the same way. Lily will be missed and remembered. Roxanne’s sense of humor throughout the past year reflects her inner strength and has been an inspiration. Peace, Lily, Roxanne, and Tom. I’m so deeply sorry for your loss. Lilly’s story inspired many. Thank you for sharing it with all of us. I’m going to miss reading about the dear girl. Please know that you are in my thoughts during this difficult time. Wishing you peace and comfort. Maggie recently posted..Meet the Bloggers: Well, hello there! Oh, Lilly. I’m so sorry, little girl. And Roxanne, I’m sorry for you. Take care of yourself! I am so sorry for your loss. All pet owners grieve with you! Lilly was the Champion of so many hearts. Your devotion and care for her was inspiring. Love knows no limits and the love affair between you and Lilly will continue to live in your heart and in your memories of her. Rest in Peace, You and LIlly were courageous fighters. 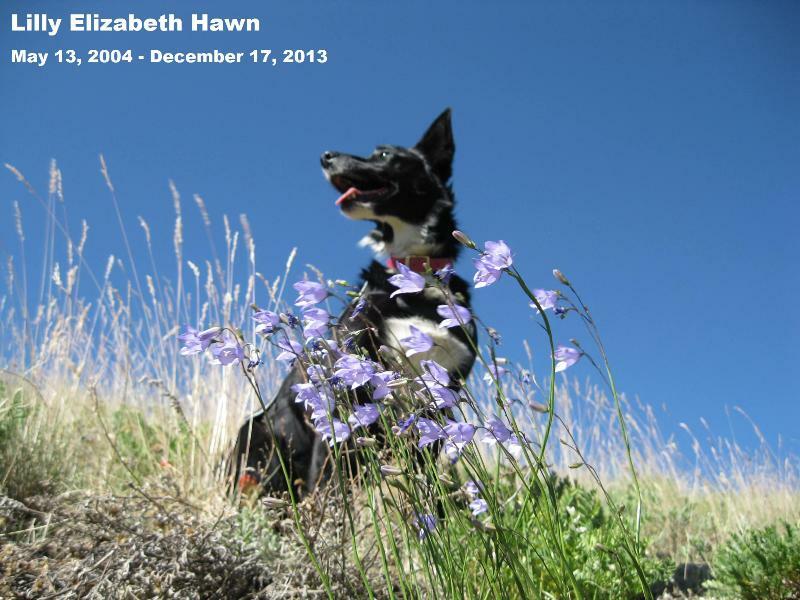 Roxanne, all dog lovers — people who are connected with their dogs — grieve with you. We unite in this grief, as we are assured we will need the support and love from others at some point. Anyone who loves a dog knows, from the beginning, that this beautiful ride will most likely end long (long!) before we’re ready. Sending love, hugs, warmth, and sympathy to you. Roxanne – Oh, my heart just breaks for you. I’m so, so sorry. Sending you big hugs. May you find the strength to face tomorrow in the love that surrounds you today. There are no words. Lilly touched so many lives, and I loved reading about her throughout the years–she taught us so much about life, spirit, love, tenacity, tenderness, playfulness and so much more. She was a joy. Take comfort in knowing that you were the best family Lilly could have ever had, and that she will always be in your heart. She’s in mine. Love and light. I am so, so sorry for your loss. I think about how much you and your husband gave to Lilly and how much Lilly gave back to you both. I’m sitting here with tears running down my face as I’m writing this. She was such a beautiful dog. Now, it’s time to take care of each other. Oh this breaks my heart. I am so so sorry. Oh Roxanne. I’m crying as I’m writing this – my heart is breaking for you. I simply can’t imagine how hard this must have been for you. Losing a soul mate dog like Lilly is devastating. I hope knowing how many lives Lilly touched through your stories will bring some comfort in the days, weeks and months to come. I have no doubt that Lilly’s story saved lives, and will continue to do so. Be gentle with yourself during this difficult time. Ingrid King recently posted..Euthanasia: To Be With Your Cat, or Not? I have followed your story from afar and am so sorry and sad for you. You inspire many dog lovers and i hope you have the strength after this to continue to do so. You and Lilly are well loved. Rest in peace sweet girl, you will be missed. There aren’t words that can express — or heal — the pain you must be feeling. But Lilly knew she was loved as much as any dog could be, and returned the feeling. And you shared the precious time you spent with her so eloquently, making her struggles and yours live with us too. So she can never be gone entirely. Sending love and support in the difficult time ahead. Such an angel she was. Run free, sweet Lilly. I am so sorry to read this very sad news. So sad. You were the best mom Lilly could ever have. Rest, then run free Lily! I am so very sorry. Lilly was a beautiful girl and such a fighter. My heart is with you and your family hoping you can find comfort in your meteorites of a life well loved. Leslie recently posted..Black & White Sunday – Oh those ears! Roxanne, I am so, so sorry. Lilly put up such a great fight – she was that kind of girl. May she rest in peace and may the happy memories you have of her help heal your broken heart. I know I sent my condolences on Facebook, but I wanted to stop by here as well to tell you how sorry I am for your loss. All us dog lovers know what you are going through, not that it makes it any better, but at least you will not feel alone. I hope you find some peace…and all your good memories of lily will lift your spirits. I am so so sorry to hear this news. Sending lots of love your way. I am so very sorry to read about Beautiful Lilly. Like many others, I have followed your blog and loved reading how you and your husband loved and gave your all for Lilly. Lilly has a place in the hearts of all of us who stopped here every day. She runs free now and will wait for you. May you find peace in the wonderful memories she gave you. Oh Rox, my heart is breaking. Run free sweet Lilly, you free now. I’m terribly sorry for your loss! Oh, sweetie. My heart hurts for you. Lilly was a truly special girl, and she touched many a life. You will be in my thoughts & I am sending a giant, loving hug your way. My heart is breaking for you and Tom…knowing this day was inevitable never makes it any easier. Lilly received so much love from you, she was never lacking in that regard. I’m so sorry. I can’t imagine how hard it must have been to say goodbye. Lilly has touched so many people through your stories of her. I hope that is some comfort to you. Pamela recently posted..Why Do Dogs Jump?